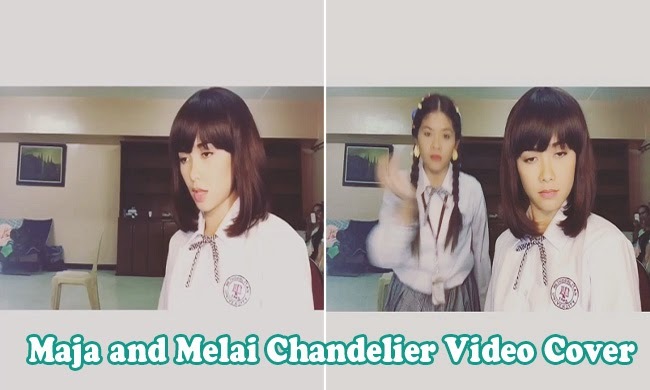 Maja Salvador and Melai Cantiveros Francisco’s comical cover of Sia’s ‘Chandelier’ had gone viral over various social media gathering almost 10 thousand likes in just three days after it was posted on February 8, 2015. Dressed like high school students n the video, Maja Salvador was lip syncing in the song then Pinoy Big Brother’s alumna Melai Francisco wittingly did her antics. Maja turned away from the camera but evidently shook with laughter. Melai twirled around, laid down on a chair and even stood on its seat as she tried to imitate the same energy portrayed in the original video by dancer, Madison Ziegler. The original official music video of Sia’ ‘Chandelier’ had been published on YouTube since May 6, 2014 and had already been viewed more than 500 million times. Her song included in her album, 1000 Forms Of Fear, was also nominated for 57th Grammy for singer/songwriter. Many netizens had posted their reactions saying that the whole clip was hilarious and even made their day better. Three clips had been posted by Salvador in her official Instagram account. Salvador has more than 850 thousand followers. In the clips, it was evident that the two artists had fun and are able to get along very well.